Friday morning, Ramon knocked on the door of our apartment. After an exchange of words, it somehow became clear to me that he had come to collect towels that wanted washing, exchanging them for new, clean ones that he fetched from downstairs. Ramon is a person of some responsibility within this building, but I cannot understand most of what he says to me, and he does not seem to understand most of what I say to him. Ramon said a lot of words to me on Thursday related to the important purpose of the special blue lock-boxes in the laundry room and how we are not supposed to have some specific thing which was contained within our lock-box in the recent past. It is unclear to me what that thing is. It is clear to me that whatever it is we are meant to put it back immediately, because it is so very important. After some thought, I did the only thing that made sense to me which was a) to show him my key and, b) to say that my husband had the other key. This display did not have the desired effect on Ramon, who again reminded me of how important it was. My first encounter with Ramon was when he emphatically said words to me that seemed connected to something about washing sheets and towels and the days of the week. If you offered me an appealing amount of cash, say $400, and told me it was mine if I could write down what Ramon told me about washing sheets and towels and the days of the week, I would only be able to shake my head sadly and slowly, because I did not understand what he said about washing sheets and towels and days of the week. What I can now say, though, is that yesterday we got clean towels, and that was Friday. On Thursday, I washed a lot of clothes, including my pair of jeans with cat diarrhea on them. 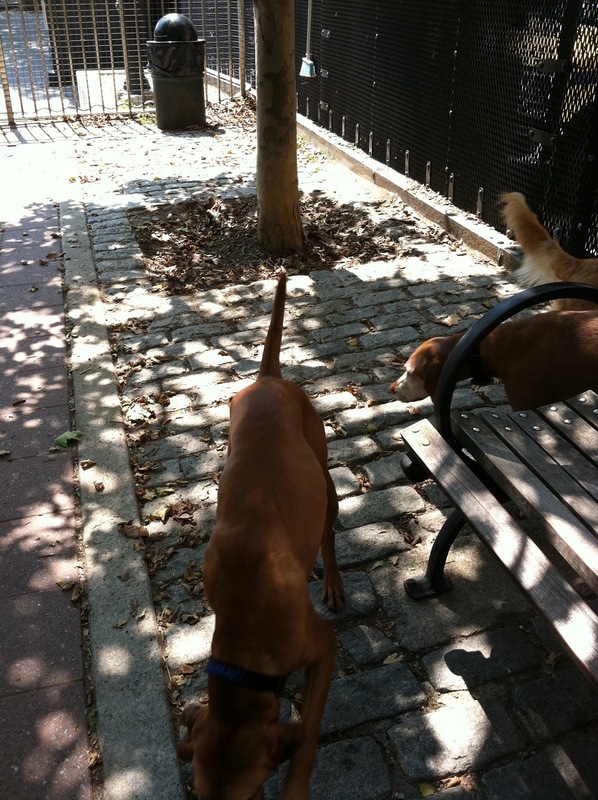 In between loads I took the dogs to the “nearby” dog park, Robbie’s park, at the Robert Moses Playground, which turned out to be the exact square footage of the apartment. Getting to the “nearby” dog park involves an approach requiring the crossing of several enormous and dangerous boulevards. Once we arrived, we were greeted by a group of four people and four friendly dogs who all left immediately. My dogs smelled thing for a while, squeezed out the required canine pavement deposits, and were ready to go. 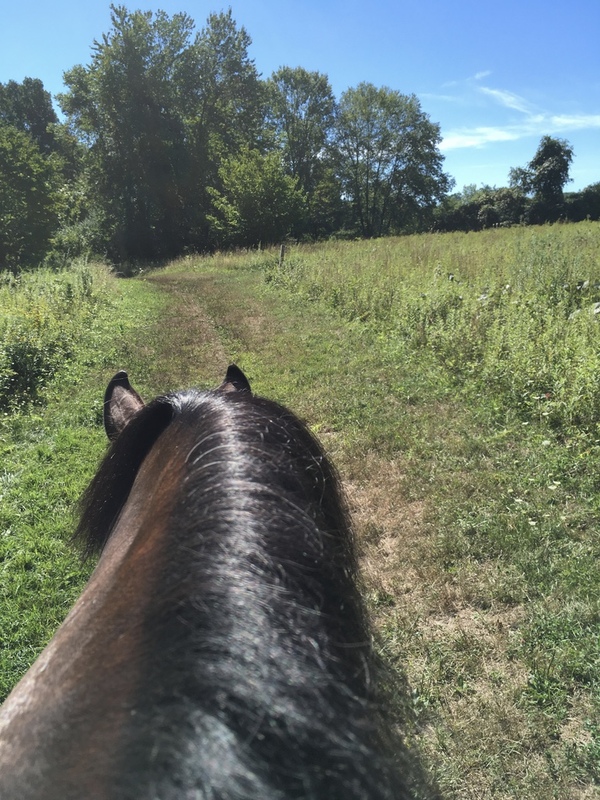 By the time we were back, it was like delivering two freshly steamed, 47 1/2 pound dumplings to the apartment: hot and panting and radiating heat. The children ignored them while I fussed in the laundry room; they were given perhaps a single teaspoon of New York City tap water, which evaporated from their hot breath before they could even consume it. I had to provide additional hydration, and they quietly slept off the experience. Three hours later they appeared to have returned to normal internal temperatures. On Friday, we walked down Madison to Madison Square Park, a charming urban gem of a park, thought to be the birthplace of baseball. 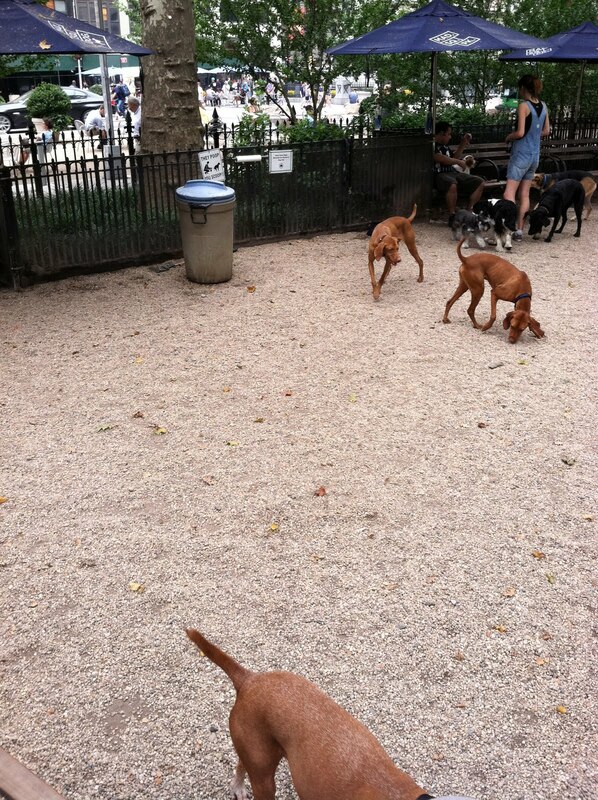 Contained within its boundaries is an off-leash dog run, which was full of dogs and even another Vizsla. Captain has two annoying dog-park habits: kicking gravel around, and barking loudly, frequently and at nothing in particular. 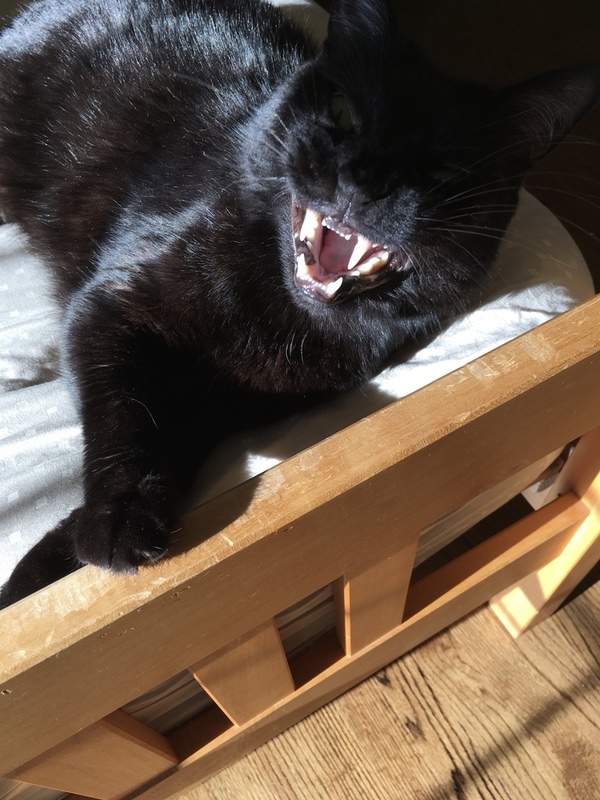 He is starting to acclimate to apartment and urban life in general, and so is much more comfortable being annoying. He did enjoy himself in Jemmy’s Park without annoying me or other people too much. 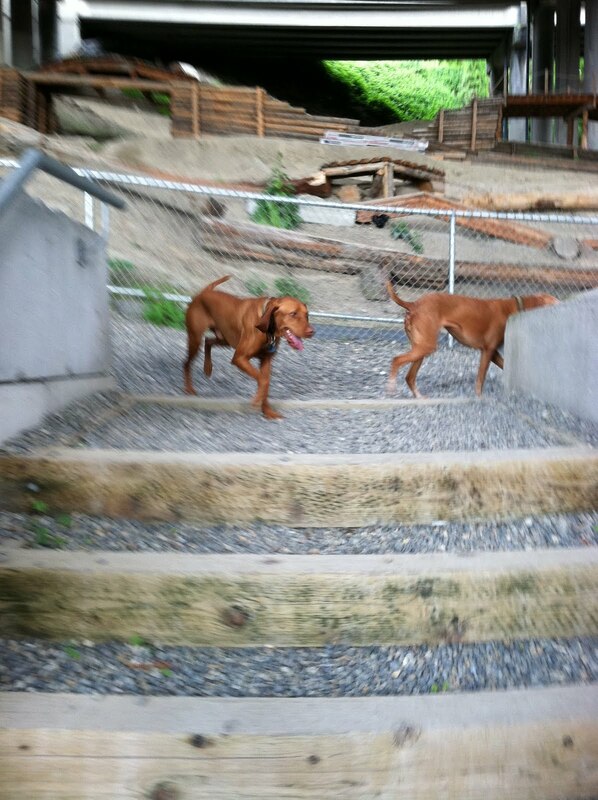 After a while a fourth Vizsla arrived, making it an Official Vizsla Party. There were Cavalier King Charles Spaniels in number, as well as a tribe of fawn-colored French Bulldogs, but it was the Vizslas that brought the outside spectators to the fence to ask what they were. On Saturday, the entire human population of this apartment was mustered and marched to a third off-leash dog run, in Peter Detmold Park, accessed from an iron gate at the end of East 49th Street just before the FDR. Some of us were engaged in a heated discussion about sleep and the nature of learning, while others were already hot and walking with our tongues hanging out of our mouths. The dogs played some and drank from the bowls of water which I suspect are a terrific source of communicable canine disease. We have several more dog parks to find within walking distance of this apartment, and once we adjust to the time zone we will dash up to Central Park one morning to enjoy a free off-leash run before 9 a.m.
After a week away, I miss Seattle terribly, for its superior climate and coffee, for the people I left behind, for its liberal politics and abundant recycling opportunities. But for all the livability that Seattle is supposed to embody, dogs are not ever allowed off-leash in all of its best parks, and the closest off-leash area is situated under I-5, further from our Seattle house than the three I’ve visited in Manhattan, and involves walking down either 282 or 293 stairs, depending on the route.